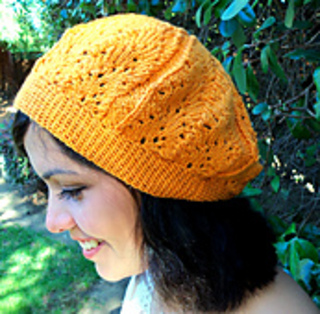 This lightweight “tammie/beret” is a quick knit from the bottom up in the round. The brim is a simple twisted garter stitch that provides flexibility and snugness, with the body done in an easy lace pattern. Francoise Tammie could also be a chemo cap for evening wear, or for when hair is beginning to grow back out! And what about coordinating mitts? They can be found here! 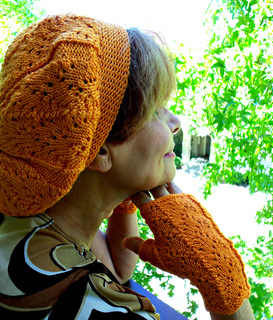 Purchase the Tammie and the Mitts both for only $4.50! Put both in your ‘cart’ and then enter coupon code 24450 in the coupon code box. 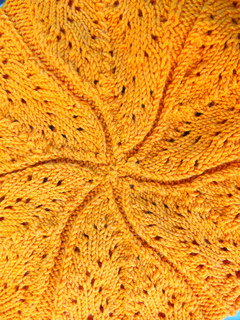 Inspired by & designed to complement the “Francoise” cardigan by Marjorie Dussaud (Tricotbec) Many thanks to Marjorie for her gracious permission to use her pattern as inspiration!!! 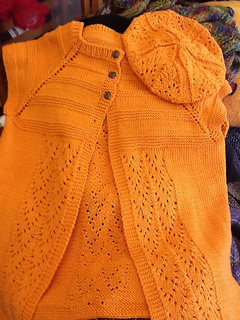 Last photo is of the cardi and tammie together taken at The Golden Fleece LYS in Santa Cruz, Ca. And Many Thanks to both sista Debbie Fring Bellsisterdebbie and Sandy Hamilton (SandyHam) for their test/tech knitting/editing as well as my lovely niece Rachel Beltran for her beautiful modeling!!!! I love you guys!!!! !